EAU CLAIRE, Wis. -- Babbette Jaquish loved a lot of flowers, but sunflowers were her favorite. 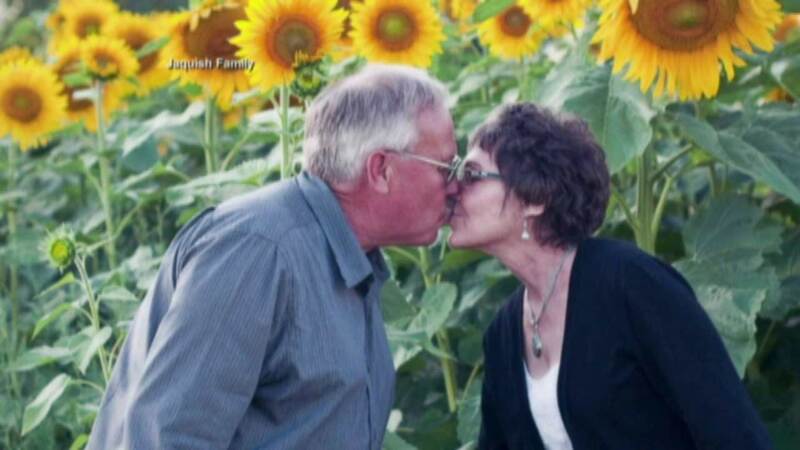 So when she passed away from cancer at 66 last November, her husband Don Jaquish planted nearly 400 acres of sunflowers for her. "She was as beautiful on the inside as she was on the outside," Jaquish, 65, told ABC News. It took Jaquish - who plans to sell the sunflower seeds and donate a portion of the proceeds to hospitals, research and patient advocacy - a week to plant the sunflowers that line Wisconsin's Highway 85 in Eau Claire, this past June. Whatever land wasn't his, neighbors rented to him for a reasonable price. After a 75-day growing period, the flowers finally bloomed this month. "She got to be known as the sunflower lady of the community," Jaquish said. "So after she passed away, I thought it would be a tribute to her to plant 4.5 miles of sunflowers on each side of Highway 85." Jaquish, an Eau Claire cash grain farmer since 1972, had known Babbette, who used to sell grain equipment, for some time before their wedding in 2000. It was the second marriage for both of them. "Everyone that ever met Babbette fell in love with her," Jaquish said. "I was just lucky enough to be the guy that she fell in love with." "They were very much in love with each other. My mom would have done anything for him and he would have done anything for her," Babbette's daughter Jenny White, one of eight siblings, told ABC News. After Babbette was diagnosed with multiple myeloma in 2006, they planted several hundred acres of sunflowers around their property. A few years later, Jaquish said, his wife had the idea of raising sunflowers and selling sunflower seeds in part to benefit cancer research. Babbette had 22 different cancer treatments through the years, many of which were through clinical trials, Jaquish said. "She realized the importance of research in clinical trials. She went from being expected live two weeks to two months to nine years," said Jaquish. "Her attitude was every day I can stay alive I'm one day closer to a cure." "Unfortunately, her health just kept declining over the years, and it got to be too much to start and operate a business when she was so sick," White said. "I think she would be smiling," Jaquish said. "We had an amazing response. We've had people all over the world send emails." And in Eau Claire, Babbette's family has been overwhelmed by the love and support from visitors who've come to see the sunflowers, which only stay in bloom for two weeks. "We wanted it to be a statement of love. There's 4.5 miles of sunflowers, and it's an enormous, beautiful sight. And that's just like my mom. That's what she did with her life," said White. 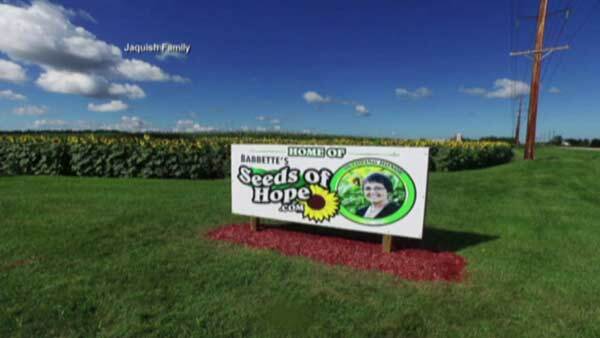 Babbette's Seeds of Hope will soon be available for purchase, with her story on every 25-pound bag of sunflower seeds, and Jaquish said they'll plant sunflowers for her every year. White said they haven't yet decided how much each bag will cost and what portion of the proceeds will be donated. "I hope that eventually we can find a cure for cancer, so other families don't have to go through what we have," Jaquish said.